Tea Tree oil has grown in popularity in recent times, as majority of people these days, prefer herbal and ayurvedic treatments over chemical-based products for most common ailments. The antibacterial, antimicrobial and antiseptic properties of Tea Tree oil are well-known, and therefore, it proves to be an all-round beneficial product for overall good health of an individual. Unlike what its name suggest, Tea Tree oil is not extracted from tea leaves or tea oil. Rather, this magical product is extracted from leaves and twigs of tea tree through a process of steam distillation. The plant is considered an all-cure miraculous plant since ancient days. It is never an exaggeration to say that Tea Tree Oil is a miraculous product for health ailments. This medicinal extract has worked wonders for human health time and again, and is believed to treat majority of infections and boosts immune system. Apart from major health issues, it also helps in treating skin and hair related issues. Ayurveda makes use of tea tree and its essential oil for treating several infectious diseases and respiratory disorders including Asthma, Tuberculosis, Bronchitis, venomous bites, acne, psoriasis, dermatitis, and other skin problems. Ayurvedic treatment begins with identifying the unique individual constitution, made up of three energy elements known as doshas, including vata, pitta and kapha dosha. Tea tree essential oil is believed to have equal effects on all three doshas, given, its cooling and moisturizing energies. Therefore, Tea tree oil is considered to be extremely beneficial for skin, respiratory system and nervous system. In Ayurveda, Tea Tree Oil has been used as an antiseptic bactericide since primeval times. This is due to its effectiveness in treating various skin ailments, given its fungicidal, antimicrobial, disinfectant, anti-inflammatory, antiseptic and antiviral properties. Treatment of wounds & Scars: Tea Tree oil (2 drops) is mixed with Jojoba oil (15 drops) and applied on acne or wounds for quicker healing and visible results. This blend is also effective on scars left by accidents, pox, acne, surgical and stretch mark. Treatment of respiratory disorders: Tea tree oil is used largely in treatment of viral infections like cold, cough, and other respiratory disorders like bronchitis, sinusitis asthma, tuberculosis, and pharyngitis. Being a good expectorant, it loosens phlegm and mucous deposits that cause breathing difficulties. Tea tree oil can be added to warm bath water, or two to three drops of the oil can be used during steam inhalation to open blocked nasal passages and treat congestion and headache. The oil can also be directly massaged on to chest, neck and back at bed time for significant relief. Treatment of nervous disorders: Tea tree oil has a warm, spicy, and yet refreshing fragrance that pacifies and inspires the mind. Therefore, Ayurveda believes that tea tree oil can soothe mind and body when dealing with anxiety, fear, fatigue, or shock. For a good relaxation, massage your body with tea tree oil (five drops), blended with coconut oil (40 to 45 drops). This can lift up your mood, relax muscles, strengthen your emotions and alleviate stress. Else, tea tree oil (3 drops) can be added to your diffuser to clear your mind and render a fresh feeling. Treatment of Athlete’s Foot: Tea Tree oil has been shown to fight the fungus that leads to all types of skin infection including athlete’s foot and jock itch. Combine tea tree oil (5 drops) with any carrier oil like almond oil (5 drops), and drop these into a cotton ball and apply on the skin, or just mix it in the palm of your hand and apply twice daily to treat fungal infection. Dandruff and lice: Among major hair problems that spoil the health of hair are dandruff and lice. Tea Tree Oil, being an effective fungicidal and antimicrobial oil, helps fight against dandruff causing agents and nourishes dry scalp and kills head lice. Two drops of tea tree oil can be added to regular shampoo or hair wash and massaged gently onto the scalp. Boosts immunity: Tea tree oil strengthens immunity and makes your body resistant against the effects of all kind of infections. 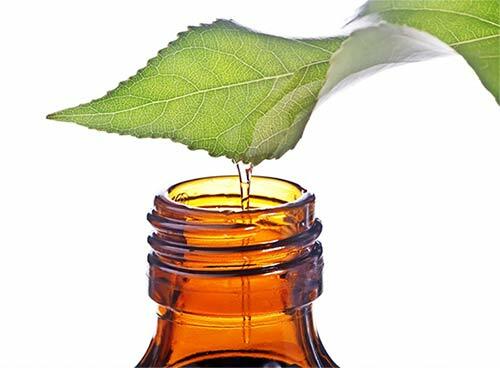 Topical application of 2 drops of tea tree oil, with 10 drops coconut oil can treat psoriasis, bed sores, wounds, boils, insect bites, abscess, diaper rashes, cold sores, dermatitis, herpes, genito-urinary infections, cystitis, vaginal thrush, deep wounds and ear infections. Tea tree oil is considered as ‘liquid gold’ due to its effectiveness in treating multiple health problems including rheumatic pain, oral infections, bad breath, candida, flea bites, cankers, warts, ticks, sunburn, mosquito bites and what not! However, consult your Ayurvedic practitioner before using it for your health condition and individual body type.